Looking for a suitable director or vice president of engineering might be a cumbersome task in many ways. As interviewers, most of you would like to see the best out of your candidates but it can get confusing to ask them the right questions. Since managing is a difficult duty to accomplish, you have to keep in mind that the person you select should have all the qualities you are looking for. They should be able to connect to the subordinates of the company, handle all paperwork and documents, stay vigilant and alert during working hours and establish a good reputation among his colleagues. It is his chore to plant a friendly and hospitable environment at work. But the bigger question here is, how will you know whether they are capable enough? The answer to your questions lies in this post. 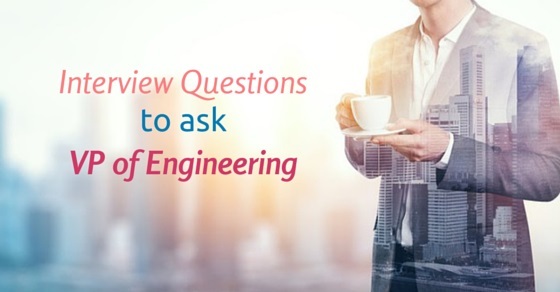 The article will disclose to you the top interview questions you must ask your candidates in order to see through his personality and finally discover if he is worthy enough to become the next VP of engineering of your company. And if you are someone who is about to attend the interview, here are some of the director level interview questions in which you can provide an answer to some of the most basic yet challenging questions. 1. How will you communicate with your team? In order to communicate with my team in an efficient and smooth manner, I will first listen to their ideas and thoughts. When we pay attention to team situations, we are automatically able to ensure that everyone is working towards the same objective. I will also pay full attention to my employees when they are expressing their ideas. I should encourage them to be creative and innovative individuals. This will improve their performance too. Secondly, I will try to build rapport with my team members. Once I empower my senior colleagues, they will emerge as successful beings in the field of engineering. Finally, I will take things with a diplomatic approach. I will be mindful of doing what is right and give my subordinates new opportunities on a regular basis so that they can explore and expand their knowledge and skills. 2. How will you protect your team members? The first thing I will do in order to protect my teammates is to identify the project vampire and kill him instantly. Project vampires will slow down progress, discourage the members and push them to inactivity. The way to detect them is by taking control of the situation, especially when they are about to lose control. I will spend time at the front end and mobilize my team until it has a proper plan and understanding of the outcome. Project successes are often tarnished when leadership isn’t strong enough. Therefore I will make it a point to keep in touch with most of my colleagues at all times. The more I portray myself as a trustworthy person, the more my leadership qualities will be boosted. 3. How will you handle bad team members? Handling bad team members often drain the energy of the team. However, it isn’t entirely impossible to take care of the situation. The best thing I can do in such cases is supportive as much as possible. What never works is being negative about those who are already filled with animosity. So it is advisable to understand why they are being so vengeful or negative towards a particular something. Do they feel ill-treated because of some colleague? Or did they just give into their emotions? Once I find out the real cause, it will be easier for me to coach them. I should be hired because of my industrial experiences, my technical skills, soft skills and experiences. (This is actually a good opportunity for you to express your mind and speak about your education and training. Tell the interviewer about your awards and accolades. Discuss interesting experiences in brief). 5. How will you handle conflict in project management? Team conflicts are quite common among group projects. They are not bad all the time though. Conflicts will always give you an idea on the important issues most team members face. This can be solved with frequent meetings. An environment of mutual respect will also improve the situation significantly. People should be willing to agree and disagree with each other with respect. To acknowledge the situation and respond cautiously will be of great help. No matter what, I will always ensure my team members are always feeling safe when it comes to sharing their ideas with me. The more I appreciate the members, the lesser conflicts will emerge. 6. Tell me about a time you failed in the past? When you are speaking about your failures during an interview, do not mention those that haven’t taught you anything significant. You should only speak about those that have helped you in some way. When you speak about no failures at all, the interviewer will think you are not a risk taker. They will also have the impression that you don’t set goals for yourself or take responsibility of your actions. Even though it can get difficult to admit you have made a mistake, make sure you don’t hide or shy away from them. Be honest about it and use the right words to put it across. Be confident and speak about how these mistakes have made you a better individual in the field of marketing. 7. How do you take care of your health? It is important that you answer this question with precision. Do not speak about bad habits whatsoever. Speak about the good ones you have adopted recently. If you have joined the gym recently, go ahead and speak about it. You don’t have to get into the details of anything. A general idea, in brief, should definitely help you. You can begin your answer by saying that you like to be an inspirational person. You work hard towards achieving goals and influencing those who fall under you. I make it a point to consult my team members before a final decision has been made. Open discussions should always be organized for making decisions. When extensive researches are conducted, the team becomes more effective with time. Not just that, speaking to your co-workers about their talents and performance levels will make things easier. They will feel encouraged to work harder. Therefore it is very important for you to display to the interviewer that you can handle the talents of the people working in your office and balance them together so that the team can handle itself even when you are not there. 9. Would you call yourself an organized person? When you answer this question, do not reveal any organizational flaws. Do not give them the idea that you’re a clean freak either. Instead, discuss your capacity to handle stress and manage work pressure. You could say something like “Yes I am an organized person“. Even though I am aware I will be working on the Atkins proposal for today, I still take the initiative of viewing my present status and prepare for the current goals”. As an interviewer, you can throw open a real life situation. Discuss the problems you were facing and ask them how they would handle the situation if they were present instead of you. This will bring out the real talent of the person sitting in front of you. Tell them to enlist their experiences. What was it like to handle a challenge? If not, what was the reason behind it? Did they learn something? This will certainly help you understand your candidate better. It is important to know what kind of a mentor the next VP of engineering of your company can be. Go through the resume and ask them to pick something they are aware of. Then request them to teach it to you in their own way. This should be very interesting. If you are able to ask these Director level interview questions to your candidate, you will definitely have a grasp on the sort of individual they are and whether they will be able to handle the upcoming challenges of the company. You will also know whether they are well experienced or if they need some more time. In case you are about to sit for the interview, you will at least know how to answer the questions put forward. This will help you get a grasp of the situation and handle the interview with sheer confidence. With that, I wish you good luck!